KUFFARS, kaffirs, infidels…whatever…are deadly (and pejorative) descriptors used by Muslims towards non-Muslims, aka “non-believers.” Not only that, they are in no way equivalent to this and that derogatory epithet hurled by westerners towards those they find distasteful. One is absolutely deadly in intent, the other is sticks and stones-like. No comparison. Period. INHERENTLY, westerners are either ignorant of said distinctions or choose to believe that Allah’s Muslim Terrorists can be “dealt” with. Good luck with that! In reality, kuffars etc. have 3 options: Convert, pay jizya, or die. But it is not as if Muslims are hiding the choices from “non-believers.” Far from it. Separate laws govern Muslims and kuffars in an Islamic state with kuffars being viciously suppressed. For example: the blood payment to the family of a murdered Muslim man in Saudi Arabia is 1,000,000 Riyals; the payment to the family of a murdered Hindu woman is 3,333 Riyals. NOW, the imperative to convert is self-explanatory – you accept the pagan moon-god Allah via the shahada or not. READERS, study these truths very carefully. They are a matter of life and death – yours. Believing Muslims do NOT tolerate, nor accept, a middle ground, even if it appears as such on the surface. Moreover, apostates from Islam are killed alike. You are all in or all out. Again, period. Dr. Hatem al-Haj, a senior committee member for the Assembly of Muslim Jurists of America (AMJA), confirmed in the below fatwa from July 2011 that the Islamic punishment for apostasy is death. A couple of things stand out to me about this fatwa. First, this fatwa was taken down from AMJA’s website as far back as October 2011, along with other fatwas on the same topic, possibly in response to an article written by my colleague Andrew Bostom exposing the rulings in that same month. (See the fatwa on archive.org, while the link on AMJA’s website is broken.) So either AMJA changed their minds about the penalty for apostasy; or, more likely, they just don’t want non-Muslims seeing what they really think on controversial topics. If that’s the case, then what else are they not telling us? Second, the question that leads to the fatwa is tellingly not asking what the ruling is on apostasy, but rather how to explain this ruling to others, including non-Muslims. While Dr. al-Haj confirms that the penalty for apostasy from Islam is death, he also recommends that when explaining this to others, you should start with the caveat that this is something which should only be carried out in a Muslim country through the court system. AMJA likes to hide behind that caveat, but at the same time they encourage Muslims in the United States to use the American legal system in order to establish Islamic law (see here and here). So isn’t it fair to assume that Dr. al-Haj and AMJA would like to eventually make death for apostates the law of the land here in the United States as well? ONTO jizya, the payment of “tribute” in order NOT to be slaughtered…well, it is not always available, even if one doesn’t have an issue with living under the boot and sword of Islam as a dhimmi! Do westerners really get it, or do they think this info is fabricated by those tarred as “Islamophobes”? The Muslim Brotherhood and its supporters have begun forcing the roughly 15,000 Christian Copts of Dalga village in Egypt to pay a jizya tax as indicated in Koran 9:29, author and translator Raymond Ibrahim reported on Sunday. Jizya is the money, or tribute, “that conquered non-Muslims historically had to pay to their Islamic overlords ‘with willing submission and while feeling themselves subdued’ to safeguard their existence,” Mr. Ibrahim explained. IT gets worse…Islam’s kiddie soldiers for Allah…the next generation of throat slitters and decapitators! Dutch Muslim immigrant kids warn: convert or die! INTRINSICALLY, these are not youngin’s who are new arrivals from Muslim nations and in “culture shock”, spouting any “nonsense” that comes to mind. Not at all. They are typical Muslims who speak fluent Dutch and have been given every accommodation possible, short of allowing them to kill or kick out every non-Muslim Dutch national! This renders them not only ingrates, but dangerous in the extreme. Tinderboxes. Believe it. Effectively, use the above video clip as a mirror template for all Muslims who immigrate to the west, whether as students, workers, “refugees” or what not. Makes no diff. INDEED, in March 2015 the kiddie element was front and center, and all evidence led to the fact that their grooming is on the upswing and its lethal effects are spreading. So, why would Americans (westerners) think they are immune, knowing full well that what starts in the streets of the Mideast/Africa ends up (sooner or later) in theirs? ALAS, how shocking is it that decapitation is now part of the “educational” roster for ISIS-ruled schools, and that its footprints originated in Libya? 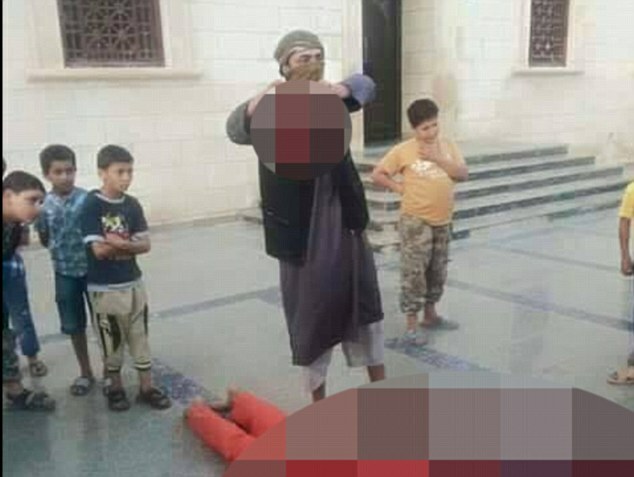 The Islamic State (ISIS/ISIL) reportedly beheaded a Libyan soldier in front of a group of six-year-olds for “educational purposes.” Supporters of ISIS posted the horrific pictures on social media. The images show a prisoner dressed in bright orange led out to the center of a floor at a mosque in Derna. Masked men with guns line up against the wall behind the captive. Men dressed in black from head to toe force the helpless man, identified asAbdulnabi al-Shargawi, to his knees before one of the barbarians takes a knife to his neck. ISIS charged the man with apostasy, which is the abandonment of Islam. After the terrorists chop off his head, another man holds up al-Shargawi’s head as the young children gather around the body. Their faces are stone cold. Sky 105 reportedthat the images “surprised many” since the children “were never shocked.” But it is possible this is not the first time they witnessed a gruesome execution. 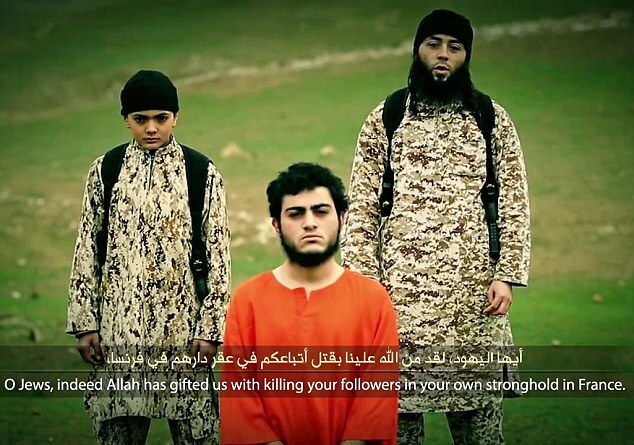 ISIS is known to hold public executions and force the public to witness it. Children are often shoved to the front while fathers hold their sons on their shoulders. ISIS captured Derna, located on the Mediterranean Sea and 801 miles west of Tripoli, in October 2014. The terrorists retained full control of the port city by January 2015. Videos emerged of large crowds pledging “allegiance to ISIS leader Abu Bakr al Baghdadi.” The terrorists control the government and education while police cars are plastered with the ISIS insignia. 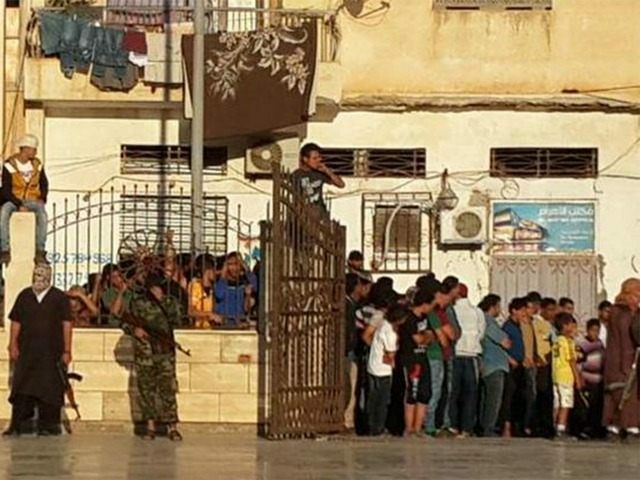 Barbaric jihadis fighting for the Islamic State in Libya have brutally beheaded a government soldier outside a mosque while children no older than eight years old look on. The savage execution took place in the northern port city of Derna, which was seized by ISIS militants in October last year as the country tore itself apart in civil war. The chilling photographs show regime soldier Abdulnabi Shurgawi wearing an orange jumpsuit as he is dragged into a public square and executed. A second shot shows a depraved militant holding the man’s head aloft while young boys are allowed to crowd around his bloodied corpse for what ISIS described as ‘education purposes’. LEST anyone believes otherwise, there are two main takeaways from the above report: Firstly, the fact is that these jihadis-in-training are mostly non-pulsed by said acts of savagery, and this is no small feat. Not only that, no one should lose sight of the fact that beheading is part and parcel of Islam, however, ISIS (as they became a force to be reckoned with when strengthened via Benghazigate) simply brought it to the forefront for the public. This too is where it’s at. CONCLUSIVELY, ISIS’s catapult (aided and abetted by the above factors) has “koshered” beheading as an “educational” tool. Rest assured, whatever is on the teaching curriculum of every single ISIS controlled area, yes, its sharpening skill set is leap frogging at warp speed to many other primary schools! AND Americans, westerners alike, must urgently internalize that whatever happens in the Mideast (and regional theaters) will eventually have knock-on effects into their spheres. Essentially, let’s just view the recent plot to behead Pamela Geller as one such exhibit that is impossible to deny. In reality, she is not the first American to be targeted for beheading, and that’s a fact. BESIDES, how many times have readers of these pages seen the Muslim Brotherhood referred to as a Mafia, similarly, in global interviews? It is not for nothing. Mind you, it is done at great risk. IN reality, terming it a Mafia is an understatement, as opposed to an overblown descriptor, but it is one which the west can best relate to. After all, if one compares Mafias, actual criminal cartels, to Islam’s hydra-like organs, the fact is that the Brotherhood is an exponentially graver threat to the ENTIRE west. Can anyone say that about criminal cartels, as awful as they are? BY the way, if this investigative journalist had a dollar – even with its precipitous devaluation – or its shekel equivalent, every time the term kuffar was hurled this way (never mind death threats), the amount of money accrued would be enough to support a few less fortunate. MOST significantly, can any civilized society exist “side by side” with committed Muslims – particularly, if they ever become the majority in any community – knowing that their ideology is the polar opposite of “peaceful”, more precisely, murderous in intent?? PONDER this: Imagine, in your mind’s eye, the sheer amount of terror they would impose on any western nation, if they ever took over the reins, knowing full well the horrors they have inflicted while in the minority? Think about it. COGITATE over the fact that their kiddies are already prepped as Allah’s Muslim Terrorists, so, dare imagine what life will be like for westerners when they grow up! RESULTANT, Islam is the definition of a cancerous scourge. A worldwide plague. This entry was posted in Uncategorized and tagged "Shahada", apostates, dhimmi, Dutch Muslim immigrant kids warn: convert or die!, Islam Exposed, Islam: a cancerous scourge, jizya, kuffars:Qur'an: 8:60, pagan moon-god Allah, The Homeland Security Network by Adina Kutnicki. Bookmark the permalink. Pingback: Israel's Voice | Islam, A Cancerous Scourge, Its Incompatibility With The West! Kiddie Video One MORE Proof. Pingback: Israel's Voice | German Judges “Indict” Merkel’s Illegal Putsch; Swedish Leaders Train “Refugees” As Snipers & Rapes Continue! “Fourth Estate” Weighs In. Pingback: The Cult of Islam: Mohammedans, A Danger To Western Civilization. (Past) Time To Tell The Truth. - RepublicaNation News - America is Great!